Sweden has a positive view of the prospects of Africa, foreign minister Carl Bildt said on Wednesday. “…we are seeing economic growth, democratic development and global engagement.”, he said. 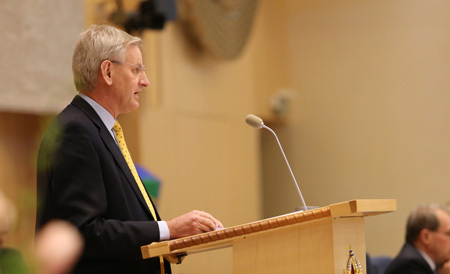 Sweden will establish a diplomatic presence in Ghana, Minister Bildt noted. South Africa, he said, is one of the countries with whom the European Union (EU) should deepen its cooperation on important climate, research and economic growth issues. He spoke of others parts of the continent moving ahead while others were being ripped apart by conflicts, mentioning South Sudan and Central African Republic (CAR). He said in the next few months the government will seek the approval of the parliament for Sweden to make a substantial contribution to the UN mission in Mali. Sweden fully supports the EU decision to establish a mission in CAR, Bildt added. “Sweden has large and wide-ranging commitments in the Horn of Africa. We base our actions on a holistic approach and contribute to the three different civilian and military operations under the EU’s regional framework. This essentially involves creating conditions for people in these countries to gradually maintain stability and security using their own capacities, ” he said.